An interview with Holli-Lynne of the KW Solidarity Network on the ongoing campaign against Kitchener-based housing gentrifiers and rental agents Revel Development. The edited intervew was first aired on the April 2, 2015 edition of The Daily GRRR! Presented here is an interview with Holli-Lynne of the KW Solidarity Network, a group that is targeting Kitchener-based housing rental and development company, Revel Developments after the company refused to pay agreed-upon fees associated with the reno-viction from her apartment. Revel Development, formerly The Madison Group, tried to intimidate Holli-Lynne and other tenants in her building into moving out in a campaign that included turning the water, power, and heat off in the middle of last year's brutal winter. In an escalation to their campaign against rental and development agency Revel Development, on Wednesday, the KW Solidarity Network picketed in front of the company's Kitchener offices. Demanding that the company honour their agreement with a former tenant, the picketers informed rush hour traffic along Victoria Street of the unethical behaviour of the company, and engaged with people who are also tenants in the company's buildings who were dropping by to pay their rent. None of the other tenants had anything good to say about their experiences with Revel. 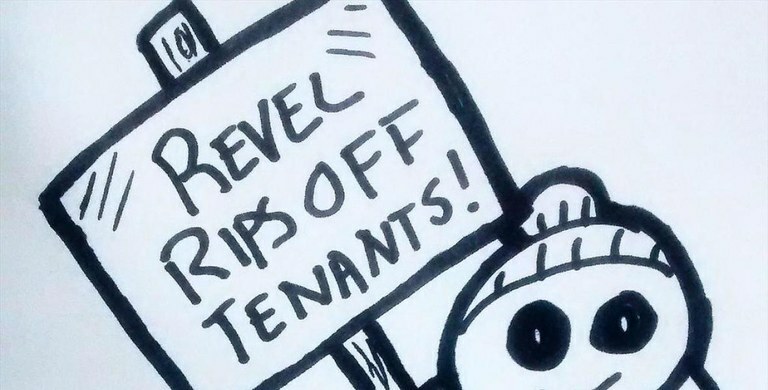 The KW solidarity network wants Revel to pay nearly $3,000 owed to a former tenant who agreed to move out during a phase of gentrifying reno-victions the company was undertaking after buying the building she was living in. During the winter time renovations, electricity, water, and heat were all continuously shut off. It has been nearly a year and Revel has thus-far refused to honour the agreement. More than 30 people were present at today's picket.